Chicagoland got the first taste of winter with a round of snow on the 4th. This was courtesy of a modest upper level disturbance that, while not particularly strong at the surface, had plenty of moisture with it. With cold air in place, this storm brought a good thumping of snow to get the winter season going. This event began in the morning of the 4th, with the snow heavy at times across Northern Illinois and Indiana producing up to a half a foot or more in many instances before moving away at night. The storm total of 6.4” at O’Hare International Airport in Illinois broke the previous mark of 5.1” in 2010 for the date. After a day or so of average temperatures, the coldest air of the season gripped the Corn Belt States beginning on the 7th and 8th. Not only was the pattern cold, it was also long-lasting and active as well. Chicago once again was in the bulls-eye for the next winter storm. This system was a long-duration event spanning two days, starting with a clipper-type system which brought a swath of snow through Northern Illinois on the 10th. The main area of low pressure then streaked across the Great Lakes on the night of the 11th. This brought another several inches of snow to Chicagoland, with an overall two-day total of 7.8” for O’Hare. Moving ahead to the 13th, a storm a quick shot of snow this time to central Indiana and Ohio. 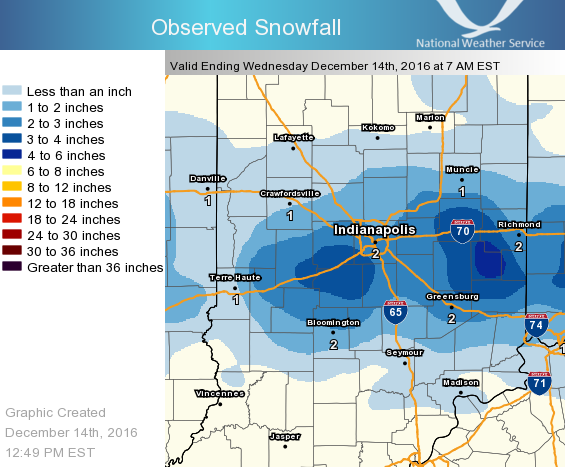 In fact 2 - 4 inches of accumulated across the Indianapolis area and over 5 inches piled up in places near Dayton, OH! 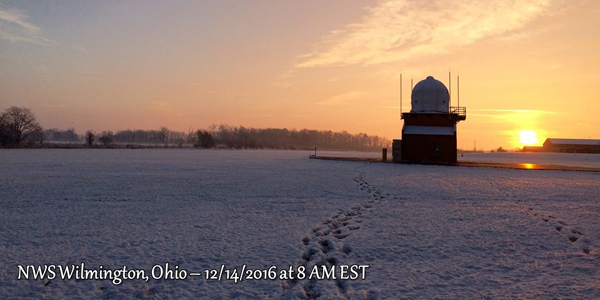 Behind the system, some of the coldest air of the season arrived on the 15th. Highs across the Midwest failed to get out of the teens for the day, with morning lows in the single digits stretching from Indy to Columbus along Interstate 70, and below-zero numbers in Chicagoland. Specifically, Rockford’s high of 8 degrees on the day set a new record for the lowest daily maximum temperature previously held in 1963 at 10 degrees. While this day may have been cold, the 19th gave it a run for its money, especially for Chicago. Both O’Hare and Rockford plummeted to 13 degrees below zero for lows. Surprisingly, while both of these numbers trumped what was seen on the 15th, they were not records. The lows were 3rd coldest on record for O’Hare and 2nd for Rockford (which would have needed to get below -21 degrees for that!). The cold and active pattern gave one more icy punch to the region on the 16th and 17th with another major winter storm, this time impacting all of the Midwest. This one not only produced accumulating snow over the northern portions of the region, but also became a wintry mess of ice through the Ohio Valley. This was all courtesy of a warm front which collided with the cold air left behind from the preceding Arctic airmass. As warmer air rushed in aloft, the cold air remained locked in place at the surface, leading to widespread icing along Interstate 70. The overall track of the main area of low pressure stayed along this route, allowing the near-freezing temperatures to hold their ground through the morning. This lead to widespread accidents, the worst of which occurred in Indianapolis, where roads turned into sheets of ice. 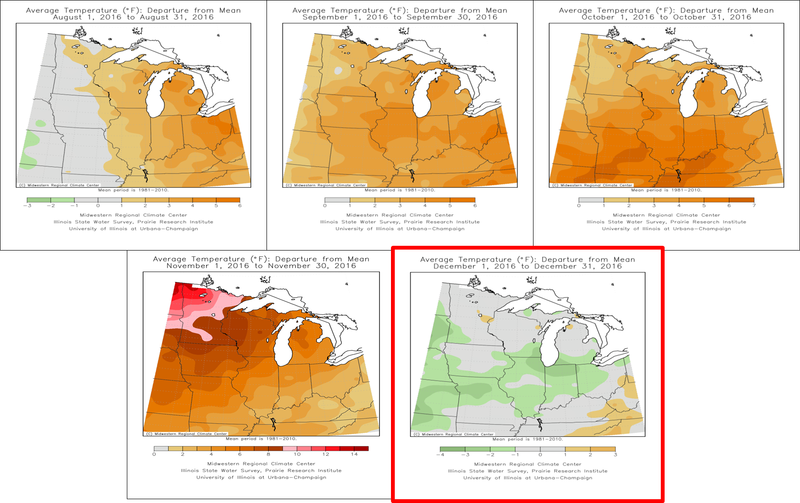 After a stretch in which month after month finished above average temperature-wise (below), December (in red) finally broke that string and finished colder than normal. Despite a warm flourish toward the end of the month, the cold first half of December proved to keep all of the major cities of the Midwest from Columbus to Chicago 1 - 3 degrees below normal on average.